Pencil and brown ink on paper. Giulio Romano trained with Raphael and was his most important assistant. Following Raphael’s death he became the most celebrated of his pupils. Giulio Romano worked on the Vatican Stanze and completed compositions that Raphael left unfinished such as The Transfiguration (Pinacoteca Vaticana). He was one of the promoters of Roman Mannerism and his figure is associated with that of Federigo Gonzaga for whom he worked for about twenty years starting in late 1524. For Gonzaga, Giulio Romano was more than a painter, also undertaking commissions for architecture, decoration and engineering. The artist left one of his most brilliant bodies of work in Mantua, assisted by a team who were able to translate his ideas into the widest range of materials. 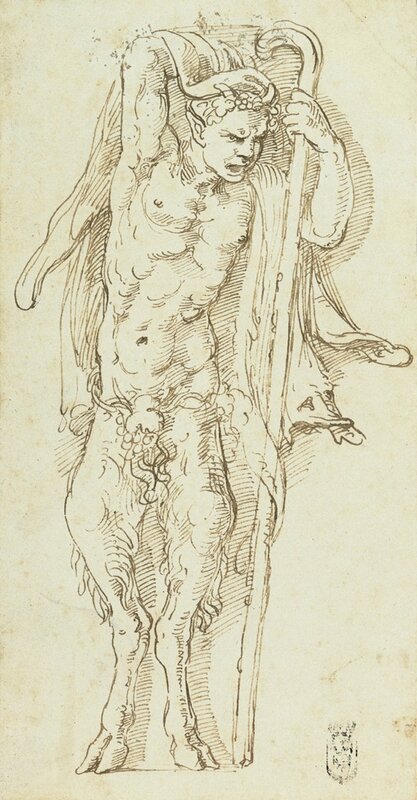 Commenting on his work in Rome and Mantua, Vasari noted that “they seem not so much rooms for men as residences for the gods made as examples to mankind”. Giulio Romano was a capricious, ingenious character and Vasari criticised his excessive extravagance in the decoration of the ceilings of the Palazzo del Te, although he acknowledged that he undertook “with great delight these capricious inventions with a poetic and picturesque sense”. In addition to describing Giulio’s endeavours as an artist, Vasari also noted that “no-one was more capable of drawing helmets, saddles, sword trappings and curious costumes, which he undertook with such facility that drawing was for him as writing is to a skilled author”. The present pair of drawings belonged to Sir Thomas Lawrence and are recorded in 1836 in the collection of Samuel Woodburn in London. The next reference to them finds them in Mertoun House in the collection of Francis Egerton, Earl of Ellesmere. They passed to his descendents until they were auctioned by the Duke of Sutherland in 1972. They were acquired that year by Hans Heinrich Thyssen-Bornemisza for his collection at Villa Favorita. The drawings were published in 1898 and were studied by Frederick Hartt in 1958. Both sheets have been related to the artist’s output in Mantua. Hartt specifically mentioned the Trojan Room in the Ducal Palace, but also compared them to a series of stuccos of satyrs in the Caryatids Chamber in the Palazzo del Te. Neither of the two sheets can, however, be identified with specific figures in that room. Both satyrs raise their arms to cover parts of their body with draperies. The male is shown frontally, leaning on a long crook and has clearly pointed ears and small horns. His fierce, wild expression is conveyed through his eyes and mouth and is emphasised by the rhythmic turn of his body. The female figure is depicted in an anatomically impossible, twisted position so that her head and one of her breasts is shown in profile. The hatching of the shadows is short and is combined with other larger strokes used to outline the forms, in which Romano emphasised specific areas. The hatching used to emphasise the bodies creates a sense of relief whose inspiration may derive from classical art.